This post is a bit off-topic and a little more serious than the usual Frugal Girl fare, but this stuff has been circulating around in my brain lately and I feel the need to put it all down into a post. When a blog (which is public and out on the internet for anyone and everyone to read and comment on) is written by a Christian author, something sort of weird happens. Fellow Christians who read the blog sometimes start to feel like the blog is like a kitchen-table gathering between church friends instead of a chat with the whole world. And when that happens, sometimes the Christians are not as mindful of their words as they ought to be. Of course, this phenomenon is not limited to Christian blogs. I’ve seem the same thing happen on blogs written by feminists or atheists or fill-in-the-blank-s. When a blog is written specifically about a belief system (like a blog about feminism or a blog about Christian faith), it is a little more fair to assume that the audience is mostly comprised of people who agree with the belief system (I wouldn’t personally subscribe to a blog about atheism, and I assume most non-Christians wouldn’t want to subscribe to a blog about Christianity). However, a blog like mine is different. I am a Christian, my faith informs every aspect of my life, and I do think that Jesus is THE way, the truth and the life, and that He is the only way to the Father. I’m not at all wishy-washy about my faith, and I’m not shy about it. But my blog is not specifically about Christianity, and so my audience is not specifically Christian. After all, you don’t have to be a Christian to be interested in saving money. For the record, I feel very blessed to have such a diverse audience…I don’t think true Christianity dictates that I live in a bubble, surrounded only by believers. Quite the opposite, in fact, and I am delighted to have readers from all walks of life and of varying beliefs! Sometimes, dear fellow Christians, you leave comments that are not as polite or humble or gracious as I’d prefer (and ultimately, as I believe Jesus would prefer), and in doing so, you alienate people who have different beliefs than you do. I want to keep my blog a place where Christians and non-Christians alike can hang out, and to that end, here are a few thoughts/guidelines about commenting here for my fellow brothers and sisters in Christ. Treat people like you want to be treated. Before you say something, imagine having the tables turned (for example, if you’re about to offer up a negative generalization about environmentalists, remember how you feel when people offer up a negative generalization about Christians). Remember the diverse audience. My readership contains atheists, Catholics, Protestants, Mormons, environmentalists, conservatives, liberals, straight people, gay people, and on and on. Don’t assume that everyone has the same worldview you do. Don’t be condescending. Non-Christians aren’t stupid or unintelligent (at least, not as a rule. You can find unintelligent non-Christians AND Christians!). Be humble. When I first started chatting with non-Christians online, I was so anxious to be right and to win arguments and debates, and not so anxious to share the love of Christ with them. Don’t be like I was! Be kind. As the saying goes, you catch more flies with honey than with vinegar. Let your blog comments be full of grace. Remember that the gospel is the main thing. It’s easy for believers to get distracted by focusing on a multitude of other issues (we love to argue about gay marriage, the role of men and women, parenting issues, and so on), but all that stuff is really beside the main point. I don’t think Jesus wanted us to go out into the world and make everyone live moral lives…he wanted us to spread the gospel. So, don’t die on hills that don’t need to be died upon, and don’t make mountains out of molehills. Remember that you represent Christ when you speak. Certainly some of our beliefs will be offensive to non-Christians, but our manner and tone should not be offensive. By the grace of God, behave in a way that brings honor and glory to Him. In the future, if a comment doesn’t follow these principles, I may need to delete or edit it in order to maintain a commenting space that is friendly to all of my readers. Please know that this post was not inspired by any recent brouhahas in the comments (in case you’re thinking, “What could possibly have been so controversial about yesterday’s miscellany post?? ?”), and that it was not inspired by any one commenter in particular (so don’t feel like you have to go over your last 50 comments with a fine-toothed comb to see if you’re the one I’m addressing! ). And also please know that I’m writing to you guys as someone who has failed miserably at this in the past. God has graciously chipped away at more of my sinful tendencies over the years, and thanks to His grace, I think that I’ve been able to better learn how to relate to people of other faiths and belief. That said, I don’t think that I’ve somehow “arrived”, so to speak. I’m in the trenches along with you guys, fighting against my pride and self-righteousness and endeavoring to live in front of a watching world in a way that brings glory to God. p.s. I would be remiss if I didn’t add a word of thanks to all of my readers for being some of the lowest-maintenance commenters in all of the blogosphere! 99% of the time, you all are gracious and kind and I am so grateful for that. Mwah! Today’s 365 post: This is a happy picture. Joshua’s 365 post: Thank you! « Hi. I’m here with some miscellany. As someone who has been all over the political and spiritual spectrum in my thirty-mumble-mumble years, I think your guidelines are by and large appropriate for anyone. I think it is absolutely possible to disagree without being disagreeable (even though I do not always attain this goal. Heck, sometimes I manage to be disagreeable even to those with whom I agree… no small feat!!!). Others will know us by our love. You did a great job and I am praying for you and your family as you are bearing much fruit. Our family appreciates your blog and your awesome insights. I am a lurker, but read daily. Greatly enjoy your blog! Just wanted to applaud your guidelines – good stuff. Amen, sister! I just wanted to say, “What a nice post”! Surely I am one of your reader who would qualify as a non-Christian, but many of my values and beliefs are very similar to those you have. I have not once, in the months I have been reading your blog, been upset by any inclusion of your faith in your posts, and for the most part, not offended by any comments made by your Christian followers (or any follwers for that matter). I enjoy your blog, and will continue to follow it daily. This is a beautifully written post. I’m not a Christian myself, but I grew up in the South, surrounded by people proclaiming Christianity and that their way was the best way and the only way and had nothing but scathing remarks for anyone who didn’t do exactly what they did. I know that this is not how everyone is, and that every religion has its share of meanies who can’t see past their blinders. But I really liked this post and how you gracefully accept that everyone is different. Keep up the wonderful work! This was really well said, easy to understand and I couldn’t have agreed more. Treating people the way you want to be treated is something all can strive to achieve and agree upon. If you can’t treat others with respect how can they respect you? Everyone needs to remember these things, not just on the web but everywhere. And we all forget them sometimes. Its also so easy to take things the wrong way on the internet, which makes it even more important to mind our words. These are the same values I try to teach my children as well. I especially loved the don’t die on a hill that doesn’t need to be to died upon. I hope you don’t mind, but I’m going to borrow that one when it comes to my teenage boys and some of their disagreements! Ah, yes. The internet is great, but it can make communication tricky. You have to work doubly hard to make your tone and intent clear when your communication tool is the typed word! Thank you. I read your blog every day, and I’m a rabbi. I really appreciate this post. It would be a shame if the discussions on your blog were limited to the Christian “table” only. <3 Keep up the good work. Your Q&A post did stick in my mind yesterday- and I was thinking that I didn’t want to be reading a Christian blog (as a non-Christian)- like you said you wouldn’t subscribe to an atheist blog! So thanks for reiterating that your faith influences all aspects of your life- and of course it’s going to be appearing on your blog. And thanks for looking out for us and stressing that we should all keep the conversation respectful. You sound like the best kind of Christian. Where is the “like” button? I absolutely agree with this! Yes! I mean, I do read blogs written by authors of all sorts of belief systems. As long as the blog isn’t mainly ABOUT that belief system, I usually can enjoy the blog. For instance, SouleMama appears to celebrate stuff like Solstice and whatnot, so we clearly have some differences in our beliefs. But her blog isn’t mainly about that kind of thing, so I have no difficulty reading it. As a secular blogger of similar material (frugality, food, etc. ), I really appreciate this post. I realize that many of my own readers are Christian, and I like to focus on the common ground we share, rather than emphasize the one (albeit major) area where we differ. As someone said above, people can disagree without being disagreeable. I like that. I enjoy your blog and plan to stick around! Amen sister. As a Christian myself I cringe when I hear others judge, condemn or place blame on others. It is not ours to judge, that is reserved for our Heavenly Father. We are here to treat others as Christ would have. Thank you for that reminder. This is wonderful! As someone who at one time was engrossed in Christian culture and now isn’t this is such a refreshing blog post. I think you represent your faith beautifully. I love that you express who you are without pushing it down anyone’s throat. You are a refreshing change from a lot of the Christians I have encountered. Thank you for your blog and your grace. No, no! I like readers who aren’t quiet. lol Comment away. I’m also a lurker here and thought I would pop my head out to say hello. This is an incredibly well written post. I applaud your deisre for there to be friendly and relaxed relations between the peoples of all types who frequent your blog. Three cheers for you, Kristen! A lovely post. I’m a Christian stay-at-home mom who practices a lot of the things you practice (baking from scratch, practicing frugality, homeschooling), but I’m utterly turned off by 99% of the Christian SAHM blogs out there because they’re just unbearably preachy and holier-than-thou. Even though I share the same worldview as those bloggers, I don’t want to align myself with them at all. I have one word for this post. Amen! Thank you for such a lovely post. I have your blog in my reader and I enjoy your posts. You are absolutely correct in everything you have stated in this post. It’s nice to see other open-minded and respectful Christians represented. Thank you SO much for this post Kristen. There have been a few comments lately that have been sort of stinging. I was raised Catholic, and if asked I’d say I was Catholic, but I don’t go to church regularly. I do however consider myself a good, caring, loving person, and I try to strive to improve myself constantly. It’s very hurtful when Christians make blanket statements to the tune of “if you’re not a Christian you’re an awful person”. I don’t claim to be perfect, but I do constantly strive for improvement and to be the best person I can be, and I think that’s what matters for all of us, religious beliefs or not. I’d also add that I don’t follow the beliefs of the Catholic church in their entirety. I guess that makes me a bad Catholic, but I don’t think it makes me a bad person. I don’t agree that you are a ‘Bad Catholic.” I think everything, including religious beliefs, is all about balance and moderation. There is extremism (of sorts) in almost every religion and so we take what we need and leave what we can’t. The over-arching “To believe or not to believe” is germain and up to the individual. Let me join in the chorus of thanks for this post! Thoughtful and well said. Thanks for this post. I am a non-Christian, and a I-don’t-know-what-I-believe-er. I am probably about as opposite of you as someone could possibly be. And yet, I am so drawn to you and so moved by your faith. I think this is because rather than proselytize, you live your faith, and you lead by example. If ever anyone has made me consider Christianity, it is you. You live by your convictions and you do it in such a non-judgmental way. One of my all-time favorite songs ever is Breath of Heaven. A strange song for a “non-believer” to turn to in times of need, but I think it’s safe to say I’m not actually a non-believer. At any rate, when I think of that song, I also think of you. Thanks for your blog, your thoughts, and putting yourself out there. You have made a difference in my life! Aww, that means a lot to me, and I’m glad that observing my faith has had that effect on you. I agree with this! Your post about being a good servant meant a lot to me. Like you said in your post, your blog is about frugality, not about the tenets of Christianity. I love how you are true and honest about your faith, and how it influences your decisions in life, when it naturally fits the situation. I think that Christians sometimes tend to think that if you are a Christian, then everything you write should be about Christian morals/beliefs. But that’s a curious position, because no one would say that a building contractor can only build “Christian buildings” or a teacher can only teach about Christian doctrine. Rather, you are a Christian and you spread the Gospel through your LIFE. Your job should just be a means to build relationships with people in order to do that. After all, I believe that God is about PEOPLE, not blogs, books, or buildings. Oh, my goodness, yes! This is one of my pet peeves. Sara Groves, a Christian recording artist, has written some songs about marriage (one of my favorites is “Fly”…LOVE that song), and she got flack for it because the song wasn’t explicitly Christian. I hate that reaction. Christians should write love songs, I think, and they don’t have to be specifically about God. Christians should make their homes comfortable, nice places, but they don’t have to plaster the wall with Jesus plaques. Our Christianity should inform everything we do, but that doesn’t mean everything we do has to be explicitly Christian. Thank you, Kristen! I get a lot out of your blog, even though we are at completely different places in life. Good article. The nice thing about blogs is that if the author is covering a topic we don’t like/agree with/find interesting/etc. we can always skip it. For instance, I usually skip over your grocery shopping lists because, being “The Single Saver” I just can’t relate to shopping for a family of 6! I love that the majority of your readers can read viewpoints that may be opposing to theirs and still comment with respect! *this is not usually a problem here, but I observe it all over the blogosphere. You’re Christian? You’re kidding Seriously, I’m Jewish and feel absolutely at home here. I don’t share your religious faith, but I very much share all of your other phylosophies about frugality and life. Great post Kristen! I think your guidelines can be applied in our daily walk, not just for posting comments. Very well written! Well said! You have a gift for saying things and I really enjoy your blog! [Joining the chorus] Thanks for the reminder, Kristen. In real life, especially, not just blog-world. I wanted to add another comment. As you know, I’m Jewish”�and absolutely love my religion. It’s what I grew up with, I believe in its teachings”�and it’s a faith that’s steeped in tradition with my family and friends. In other words, I’m not changing my religion. In college, my best friend was a very devout Christian”�and she had no trouble being friends with me. We each had our own faiths, but we shared a lot in common…and she was my nearest and dearest friend. So, of course when she got married she invited me to her wedding”�which I was thrilled to attend. But her fellow Christian friends/family at that wedding spent the entire time berating me for my faith, told me there was only one right way to believe, and that I was clearly wrong and worthless. Instead of enjoying that wedding, I left there crying! I’m pretty sure that Jesus, and any g-d any of us believes in, wants us to be kind to one another. I love the fact that on this blog (a frugal-Christian blog), I can have my own faith, but be welcome. I think it is so important to learn about all religions and cultures. It is better to be knowledgeable and agree to disagree than to be ignorant. I am so glad Kristen raised these parameters of posting. AMEN hehe sorry just love your blog and yeah we all need to be nice to each other and try not to hurt others feelings. We are all people!!! Yay for People!! Lovely post! I’ve always wondered why some Christians think that being a meanie to someone who isn’t Christian would make them want to become one! I know that I struggle with being judgemental sometimes, but I hope that God is helping me get better at being humble and loving towards others. I enjoy your comments on faith and respect how honest, yet non-preachy you are in your posts. As a fellow Christian, thanks!!! I don’t know if this is the way you meant it, but I wanted to point this out – Catholics are Christians! I should probably have made my list more extensive…something like Catholics, Protestants, Wiccans, Atheists, etc. My point was that there are multitudes of faiths/beliefs/lifestyles represented by readers of my blog. I fall into the Protestant camp, myself, because I have some fairly serious disagreements with the teachings of the Catholic church over the nature of salvation and the maintenance of that salvation. I do think that there are Christians in the Catholic church, though (I know some personally! ), and certainly, God is the only one who can see people’s hearts and know who is saved and who is not. And of course, though I disagree with Catholic doctrine (and though Catholics disagree with a lot of my doctrinal beliefs! ), I definitely don’t think that our disagreements over doctrine mean that we can’t hang out with each other and talk about frugality. Thanks, I figured – Its just something I get sensitive about. I know I’m getting way off topic here, but as far as salvation, there can be a lot of misconceptions about what Catholics believe. For the record, we believe that salvation only comes through God and because of Jesus’s death on the cross. We believe that ‘whoever lives in me and believes in me will never die’ (John 11:26), but we do tend to emphasize “living in” and not just “believing in” Christ. Right-there’s the difference. I believe that Jesus paid for every single one of my sins, past, present, and future, and that as a believer, when I sin I am still in a state of grace because of Jesus. And so I follow Jesus and do what He says because I love Him and trust Him, and my obedience has no effect (for good or ill) on my salvation or my state of being in grace or on God’s love for me. And yay for that! I’m not a Catholic (not that it makes any difference as far as I’m concerned), but I’m with you on this issue. If our lives do not reflect our beliefs then what’s the point. The same principle applies to other aspects of our lives ie politics. Totally! Talk is cheap…it’s a person’s actions that truly show what the person believes. Thanks, Jackie. I felt the same way reading Kristen’s otherwise exceptional post. And thanks to Kristen for clarifying. I read your blog daily…but never comment. Today seemed like the right time to tell you (after almost 2 yrs of reading! )how much I enjoy your blog. You are gracious, intelligent, articulate and funny. I love that you share bits of your homemaking and parenting wisdom. I also appreciate that you “speak your truth”….especially in your relationship to God….you are authentically you. You made a very respectful and articulate post….thank you! Kristen – what a great post. There was one comment yesterday that stood out to me as REALLY inappropriate for your forum, and I have to give a lot of credit to your commentariat, who just ignored it and declined to start a flame war. I describe myself (at least to those who have a sense of humor) as a kid-hating atheist. However, I am female, married, and work hard to live within my(our) means. For me the things you and I have in common trump the differences, which is why I read you blog. Plus I really envy (sin! sin!) your talent with yeast breads. Keep up the good work. Well, if you are a kid-hating person, I certainly wouldn’t want you to try to mimic my life. 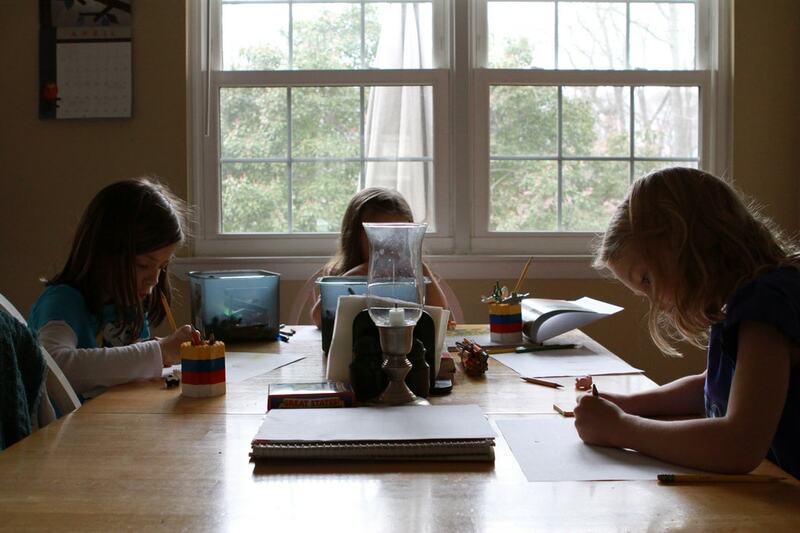 Being a homeschooling mom is probably not your calling. Hee. So, we can just keep the money-saving thing in common and call it a day! And you can skim over the posts that are full of kid stuff. Your kids get a pass because I they are cute and I can’t hear them banging their spoon on the next restaurant table! And, honestly, your home schooling posts describe a really fun, enriching experience that I think your kids are lucky to have. Great post!!! Totally pertinent for every aspect of our lives. I agree that it doesn’t really matter what particular sect you belong to or believe in, it’s how we represent our beliefs. I am Christian and my faith and beliefs shape and govern every aspect of my life. It’s so important to ask ourselves if we have been a good example and Christlike each day. Have we taken the opportunity to serve those around us, whether it be our family, friends, neighbor, or a stranger who may be in need of a small kindness. My mother always taught my siblings and me that example is the best missionary tool. Thank you for standing strong for your beliefs. As a non-Christian reader and blogger, i have to say that i appreciate both your blog as a whole and this entry in particular. i’ve always felt nothing but comfort and respect when reading your entries, and within the entries. I come from a mixed faith background, both in terms of familial and social culture and it’s sometimes a battle finding the middle ground between personal expression and pushing too hard against others’ beliefs. i actually find the way you handle religion exceptionally refreshing, coming out of a social environment in real life where i’m rather frequently told my belief set is wrong. Wow. How do you come up with all the right words? That’s a gift. Thank you for representing so many of us so well. I like this post. Thank you for so clearly stating your point of view and I wholeheartedly agree with it! Thank you for this post! I’m one of your atheist readers get much out of your blog. While we disagree about faith, I still can admire your love for your family and how you spend your “value points” with them. I too do that, just for different reasons. Thank you for writing this. It is something that has also been weighing on me. It is so easy to create an echo chamber, especially in a blog. Your respect of others was very moving. Thank you for sharing your heart and a part of your life with us. Hi Kristen, thanks for this post. One of the many things I’ve admired about your blog is how respectful you are to EVERYONE who comments here. That, plus your great content and your cheerful attitude, keeps me coming back. *Muah* right back at ya! I definitely didn’t delete your comment! Did you check all the pages of comments? When there are more than 50 original comments on a post, my blog software makes a second page of comments, and yours might be there. Occasionally a legit comment gets thrown into my spam filter too, so if you ever see that a comment of yours doesn’t appear, let me know and I can dig through the spam to look for it. oh good…I try so hard not to offend anyone, and I think so highly of you, I just would have hated to do that to you. Juli dear, I was not offended at all. I’m praying and you keep praying too! I am personally a kind of fractured Catholic. There can never be anything offensive in suggesting to someone they have faith in themselves and to pray to God, the Universe, or whatever works for them. Prayer is a conversation and a leap of faith. Does that make sense? You make an excellent point, and I found it particularly relevant to my life as I am a devout Catholic married to a non-religious man. So far (and we are a young couple) this has not presented any problem for us: we have enormous respect for each other and our beliefs. Yes, it would make my day if my husband suddenly decided he was interested in Christianity–but that is a desire only God can place in his heart, it is neither my job nor within my abilities to force religion onto my husband. As I understand Christianity, we are called to live as Christ lived and love as He loved. Not to shake our fingers at people whose beliefs don’t align with ours and make everything we say/do into a judgment of others. We should strive to do as you do, and lead by example while practicing the acceptance and love of Christ. Just because I identify as a Christian, does not mean that I am trying to force it down the throat of anyone else. Well said and with such wisdom!!! Thank you for emphasizing the similarities in people that brings them together rather than focusing on the differences that tear them apart. Well done. I hope that when I am put on trail for being a Christian that their will be enough evidence to convict me!!! Keep on sharing your faith; it is eternally important. I am a lurker from India, but I read your blog daily, faithfully :). Being Indian, I am a Hindu (the main religion followed here.. ) so I would fit into your non-christian audience.. I just wanted to pop out and let you know that this post touched me inspite of the fact that we share different beliefs.. It is an incredibly well-thought of piece of writing, one that would strike a chord with almost all of your readers… I mean, religion is such a senstive issue and again it is the sensitivity behind this post that makes your blog so special and why we come here everyday to read your blogs.. The old adage that one should never discuss religion or politics in polite company is no doubt very wise – but also very boring. How dull life would be if we agreed with each other all the time? You are a wonderful human being and I have read and enjoyed your blog for some time now. You are also a woman of strong views which, from time to time, you express quite openly. I like this. After all it’s your blog and your followers are here of their own volition. But as bloggers we surely must be prepared for readers to disagree with us, and each other and, when feelings run high, for the risk of offence being given, or taken. Either that or our comments sections will degenerate into strings of sycophantic endorsements of whatever it is we’ve written. Of course commentators should be polite, etc, but they have to be allowed to express their views or else there is no point. I have, personally, enjoyed some of the more controversial of your topics, as much for discussion they provoked as for the original post. It makes people think about what they believe, which is always a good thing. Oh, I totally do NOT mind disagreement! Debate can be very healthy, and I’d sure hate to be one of those bloggers whose readers seem like mindless zombies who worship the blogger. lol I want people to think and talk and grapple with issues. It’s just that I want us all to be kind and polite when we do it. I was raised (with a Lutheran background) to respect all beliefs and set an example with my life of my faith, not with preaching and criticizing others. Although I have traveled far in time, distance, and paradigm from those years, hopefully I have retained the ability to find the commonalities with others that allow me to connect, and to enjoy the differences. It would certainly be a dull world if everyone felt exactly as I do, and it would be (and sometimes is) a very contentious world if everyone believed their way was the only way. You have created an atmosphere here that encourages tolerance and understanding, and it allows us to learn from others who may live very different lives. Thanks for not only the frugal tips, but the laughs, and the sharing of your life. I am encouraged by your guidelines, because I am a Christian who believes that loving others will be the thing that shows Christ. Way to go and I hope that I will always be aware of the way I speak and comment. I’ve also come out of lurking to add that this was very well said, thank you Kristen! We live in a very sad world. I’ve had to disable my Anonymous comment section on my own blog because the ‘drive bys’ (as I call them) left horrible, hurtful and spiteful comments. Even though I never posted them, I had to read them. I cured all of that by selecting the option that only readers with traceable, trackable emails could leave a comment. In this way, anything disparaging could be reported to Google. I haven’t had a negative comment since. I’m a conservative and you have no idea how hurtful some liberal left meanies can be. The beauty of living in America is that we can all voice our opinion without harm. It used to be a good thing to be a ‘middle of the road’ kind of person. Now, it’s the anti-Christ. I had to delete my original bog because I used to get death threats. So, be careful. There are a lot of people who do not like Christians. Or conservatives. There are definitely unkind people on both sides of every single issue. There are conservative right-wing meanies, and liberal left meanies! I just addressed the Christians here because, at least from what I can see, Christians seem to be the majority here on my blog, and the majority always has to be mindful that they don’t get TOO comfy or unaware of the minority. But yes, I do agree that people on each side of polarizing issues need to be kind to the other side. Speaking in mean and hurtful ways doesn’t get anything positive accomplished. Well said! Great reminders and suggestions for all of us to be more civil and respectful to those around us! Kristen – what a thoughtful and well put post. I’ve read that often, the folks who do the most harm, are the ones who specifically want to do the most good and are convinced that their way is the only way! As a believer in the Universe and our interconnectedness with everything, my “religion” is in nature, the stars, the planets- all creations of God. The Four Agreements by Don Miguel Ruiz says we must be impeccable with our word. That our words have the ability to hurt or heal. I’ve often found opiniated people some of the worse offenders of the sanctity of words. We are all here and we’re all fighting a great battle…the best we can do is to be kind, reasonable, sane, non judgemental and loving to each other and our words to each other. Bless you! I have already been wondering how to balance out being a Christian blog writer and wanting to share that part of myself, but not only appealing to a Christian audience. Again, your words were very directional for me! As an agnostic who greatly enjoys Kristen’s blog, allow me to point out that one reason I find her overtly Christian blog such a joy is that while the religion is overt, not overriding. It’s quite clear that being a Christian underlies much of what Kristen does and she shares that with us, but religion is background. She focuses on *what* she does far more than than *why,* while still managing to share that when it comes to the forefront. She uses “I” statements … “This is what works for me, maybe it’ll help you figure out what works for you” or “This is what I think, I’m interested in what you think also.” I also notice that she points out that all sides have faults, that being [insert negative characteristic here] is not the sole property of any one group. My comment to the lady losing her job didn’t show up. I had a moment where I had to think hard if I was offensive. lol That is the good thing about being a mom of many, I am easily distracted. I am clueless about all this but if you felt the need to say it, I will think on it. I became a believer in my late 20’s when I was around an amazing lady who was my midwife. How I loved her and admired her peacefulness. Browbeating isn’t going to win anyone to your beliefs. Did you check the second page of comments? It might be there! I looked in my comment filter and didn’t see it there. I didn’t delete any comments from that post, and honestly, I hardly ever delete comments…I think I’ve only ever deleted a few that were just SO over the top rude that I couldn’t bear to publish them. Amen, sister! Very nicely said! What a lovely post! I enjoyed it all the more after reading the daily news. If only our politicians would take a page from your book. As a non-Christian reader, I have to say that I have never felt excluded in any way, either by you or your other readers. I think you’ve really built a lovely community here for everyone interested in frugal living. And despite living a life that is very different from yours, I always read your stories about your kids, homeschooling, etc with great interest. I think that’s the beauty of blogs like yours; they offer me glimpses into other lives and I can see how much we actually have in common despite our differences. The best blogs I think, are those that feel genuine and sincere. In that respect, I actually appreciate it when you mention your faith even though I don’t share it, because it’s such an important part of who you are, and part of why you are interested in frugal living. And this honesty is why I check your blog everyday. So thanks! as one of the Christians this (truly lovely) post was addressed to, I would like to say “thank you for the reminder.” I had times of doubt — when I struggled to understand my relationship with God — and many Christians didn’t handle my hardest moments and deepest questions with love. Those memories are bitter and sad. So, thank you for the reminder that I (we) have the opportunity to be the loving voice in someone else’s life. well said—well done! I believe our Creator (of us ALL) would be well pleased with your reminder that we are all brothers and sisters…to be kindly treated regardless of faith or creed or politics or whatever. Thank you for your wonderful support in frugal living! Don’t forget to add Jews to the list of people reading your blogs. Thank you for stressing your comments. I only wish the individuals that address my 6 year old twins were so considerate to allow others to their faiths and paths to god. Certainly….my list of readers wasn’t meant to be comprehensive. My point was just that there’s a lot of diversity here. Believe it or not, ALL true practicing Roman Catholics are Christians. That I know for a fact being one myself. I agree, well said. I have to say that most blogs or online stories I read, I rarely read the comments because there are (mostly in online story forums, yahoo, google etc.) very mean people who seem to be looking for an anonymous fight; creating hateful feelings. I have never seen that here and try to be mindful myself. It is so easy to not express yourself well online. I have been a lurker for a long time and very rarely post but I wanted to say Thank You. I am a consistent reader because I love the content and I love your heart. What a beautiful way to put the idea that it is about Christ and His redeeming work and not really about all the other stuff. May He continue to bless you and your heart for your readers and people in your life. Im Jewish and a Lesbian and Ive been reading your blog for a long time now. I read it for your menus( you and I both love Cook’s Illustrated AND the Gold touch line of bakeware), the goodwill posts, the furniture refinishing, etc. I usually skip over the God/Jesus talk because its my my faith, but I still love your blog. Well put I do not share your belief system but……..I like the way you live your life. I am thinking that today lots of people have lost the art of respect. Your blog has encouraged me to try new things. I always look forward to reading your blog. Just keep sending positive thing out and people of all view points can enjoy. i really appreciate you writing that very thoughtful post. I think when we live within our own little subcultures (as I do, ahem) it’s easy to vilify those who are different from us – and the internet often facilitates this, as it’s now easier than ever to find a group of people who think EXACTLY the way you do. But that’s one reason I appreciate your blog – it heartens me to see that people who are completely different can be united in certain common beliefs. God bless you and I agree. I am so upset about the single mom of 4 kids whose husband left her and she committed suicide last week. Please pray for her 10 year old who survived. If someone can lend a hand rather it be anything 30 minutes of watching a neighbor’s kids or handme down items ect please do it. It is hard for people right now and we all need each other. Thanks I always think what would Jesus do? LOL…I resent people who claim that Christians are the only ones with morals or a conscience or do good works. I HAD a friend who would start sentences with, “I am a Christian so….” OOPS. “I would never try to get someone fired”…or, “I would never gossip.” Pardon me? I would object and tell her that there are other good, decent, moral people in the world. After awhile she did not want to be my friend. I was talking with a familiar checker about using coupons, being frugal, the impact of plastic bags on the oil supplies and landfills. A young woman working said in the most haughty tone that she did not believe that we should worry about the environment, be frugal, or take any steps to leave a better world for the future. She stated that she thought Christ would return very soon and take care of everything. My mouth fell open and so did the mouths of all who heard her. She was so proud of her proclamation and thought we were in awe. I managed to tell her she was sadly mistaken. She decided to go work, all the while smugly looking down her nose at us. The other cashiers and customers shook their heads. So, it is that kind of desregard for the future that pins all hope on Christians and Christ. She is one Christian that probably would not read frugal girl. I find that particular cashier’s perspective so…dismissive and irresponsible. WOW doesn’t quite cover it. It makes me think about all the people I come in contact with in the world who *don’t* stun me with their views. Can I admit that I don’t seem to take notice of the people who are similar to me? It’s easier to think about the “stunners.” I guess I’m trying to say that I probably meet lots of people who do not share my religious/spiritual views, but it simply never comes up, and I should pay more attention to all the times I see *similarities* in others, and let go of the shocking encounters. You opened up my perspective with this bit of information Practical Parsimony. Thanks for that. I didn’t bother to read the 105 comments before me so this may just be repeating others feelings but I just want to say “Well put Kristen” occasionally I kringe when I read a comment that I’m pretty sure would be taken wrong by some readers. When I was a young woman, young mother, I had people who exclaimed that they did not know I was a Christian. I was honest, humble, helpful, kind, peaceable, fun, moral, and non-judgmental. “Praise God,” “Jesus will take care of it,” or some other such “Christian” phrases never passed through my lips. I prayed without ceasing and often while doing dishes. People judged me for what I was not what I claimed to be. Some of these people became friends and actually started going to church once they figured out I was a church-goer and married to a minister. Why is it necessary to drive away non-Christians and attract only those who believe like we do? My testimony was the kind of actions to which I responded. Over the years, I have moved far from that stance of my youth, but I am still have the same character traits. Now, I am no less “good” than I was then. I don’t think I’ve commented before but I’ve been reading your writing for at least a year. I’m a non-christian, Unitarian Universalist, liberal, child-free, environmentalist who never ever would have considered the possibility of making homemade yogurt or baking with yeast if it weren’t for this blog. I find your recipes easier to follow than most because of the photos and your way of making it sound so simple & achievable. Thanks to you, my friends now know to expect a loaf of cinnamon oatmeal bread whenever there’s a birth or death or celebration or extra time on my hands. I don’t expect everything on your blog to apply to me and just as I quickly skip over material regarding parenting (although one of those chore pages might be nice for my spouse!) I bypass most of the religious content. I would like to add though that in my life I’ve had the misfortune of encountering more than a few people who identified themselves as Christian, yet were less than kind. I spent several years avoiding people who seemed religious because I feared being hurt or rejected. I realize it’s not completely possible to truly *know* someone by merely reading their blog but you seem to live a life of faith without using your beliefs as a bludgeon towards others. I guess what I’m trying to say (and this is getting lengthy!!) is it gives me hope to know that there are Christians like you out there somewhere and perhaps with that knowledge I’ll be a tad less fearful of the ones I meet in my face-to-face interactions. WOW! What a great post, and what great readers you have! I am another one of your non-Christian readers and thouroughly enjoy every aspect of your blog including your posts about your faith. You do it in a way I think of as respectful to your faith, your family, and your readers. Occassionally I come across a comment here that makes me raise my eyebrows but I just skip over them because its just plain silly to get worked up about a comment from someone I will never meet. I seriously wonder who has the time to do that! Long time reader, regular commenter. I never would have believed it would be possible to love you more (without being a member of your immediate family!). Somehow, “thank you” seems totally inadequate today, but a heartfelt thank you it is. Don’t be nervous! What you said was well said, kind, gentle, and much needed advise. Thanks for tempering us “soap boxers”. I love your encouragement, keep it up. Having grown up Christian and become Agnostic I can understand both sides and I appreciate that you don’t deny your beliefs but also that your posts are heavy handed with religious beliefs. I was part of a more fundamentalist religion growing up and we were as condescending as they come. It is nice to see that not every religion is that way. I’m a non-religious 22 year old working hard to start my life, and sometimes it’s hard to choose to be frugal. It’s usually thrust upon me. I want to live a life better than I do now, which is why I subscribe to your blog, but I have never felt alienated or uncomfortable by your inclusion of religion in your posts. It opens me to another view I don’t find articulated often or well in the blogosphere. In the same way, I don’t feel alienated being outside of your age group, childless, not a homeowner, with no savings… They’re just things that are part of your life, and not part of mine, but I won’t stop reading because you write about them! Wonderful post — well-said and gracious. Thank you! And amen. Perfectly said. This was a great post, and so relevant…thanks! Amen! You make me smile. Fantastic post Kristen. As one of your number one fans who happens to be a pagan / buddhist / shaman mix I always feel very welcome here. your guidelines are for ALL of us who strive for a loving , compassionate world… Let us celebrate what unites us and agree to disagree on anything which seeks to divide. Hi, just found your blog……am loving it so far! Just happened to read this post through a link on frugal focus. Made me think I might want to subscribe. Very heartfelt talking about your own struggles. Who among us hasn’t struggled with the very same issues at some point in our walk of faith. Your post was my blessing for today. In the most humble way I can say would just like to add that Mormons are Christians, our theology may differ but we worship the same Christ as all other Christians worship:) That said I would like to add I love this post and I love your blog and you inspire me every day to be a better person! Well said! Good guidelines for everyone, of all faiths, in all matters. I read a lot of news and political blogs. For awhile, I would try to engage people when I disagreed with their point of view, always without any name calling and only with presenting facts that put their claims into question. After far too many instances of feeling overwhelmingly frustrated with people’s rude and inane responses, I quit reading comments — on any blog or news site — for quite a while. It’s refreshing to read the comments on this blog, because they’re actually constructive and interesting. Of course, there’s nothing uber-controversial written here, but it’s a nice change of pace. I am not a Christian. I’ve mistakenly made generalizations about Christians in the past. As I’ve become interesting in frugal living and homemaking, I’ve come across a lot of inspiring people writing blogs (like you, Kristen!) who are also interested in this topic, and are darn good at it, and also happen to be Christian. There are a lot Christian people who believe things that I adamantly disagree with, and that won’t change. However, I’ve come to realize that it’s much more important to embrace our common aspirations than to always focus on our differences. I believe in peace. It took me a while to realize I wasn’t being very peaceful towards Christians. I appreciate these comment guidelines you’ve written. They’re essentially how I wish everyone treated each other in all aspects of life — God or not. Here’s to more civility in the world. I just read some more of the comments on this blog, and it’s funny to see how many lurkers came out. I’ve pretty much been a lurker for a long time, too. I’ve only commented on one other post before this. I’m a few days late reading this entry, but I wanted to say thank you Kristen. You have a gift of words and this post was obviously prayerfully written. Love your blog! BTW, we Catholics are Christians. http://www.davidmacd.com/catholic/are_catholics_christian.htm Catholicism is one of the many Christian denominations in the US and around the world. Please be aware that to characterize Catholics as non-Christian appears unChristian. Catholics and Evangelicals are all brothers and sisters in Christ. I know I’m reading this post MUCH later than you posted it, but I wanted to say that I couldn’t agree with you more. There are so many times you find believers that alienate and offend non-believers with their attitudes and words. The biggest example that comes to mind is the recent campaign that sympathizes with America’s gay youth. It saddens me that these young men and women were teased, harrassed, and suffered from low self-esteem, yet Christians (as a whole) did not step up to the plate. It took the U.S. government (and some big names in Hollywood) to finally reach out to this hurting group of individuals. No matter what we personally believe about another persons lifestyle, values, or actions, as Christians, we are called to LOVE one another, just as Christ loves us. Period. Thank you for sharing this. I felt like you were speaking directly to me. I’ve been struggling with the “politics” of my faith for quite some time and it’s refreshing to know that I’m not alone. It’s heartbreaking to hear someone using God or the Bible as an excuse to spread hate.